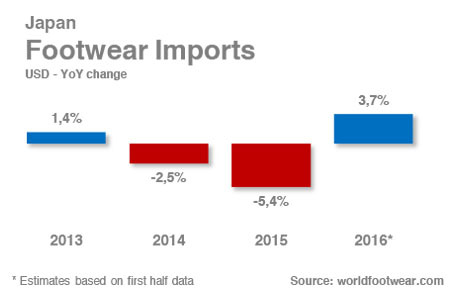 The fourth largest footwear importer, according to the 2016 edition of the World Footwear Yearbook (share of 4.9% - for more information please follow this link) has consolidated its value of imported footwear during the first six months of the current year. The latest released data obtained by the worldfootwear.com indicates that in the first semester Japan has imported 2 688 million US dollars’ worth of footwear, going up by 3.7% (compares to 2 592 million US dollars in similar period in 2015). China, the indisputable leader of the rank of main footwear suppliers to the Japanese market, registered a drop of -4.8% in value in the first semester (from 1 5001 million US dollars in 2015 to 1 429 million US dollars in 2016). This resulted in a share of 53.2% in total footwear imports entering Japan and coming from China, falling from the 57.9% share registered in similar period in 2015. However, the declined in the shipments from China is not accompanied by a single replacement movement, and no other country seems to be absorbing the lost quota on its own. In fact, from the 10 main suppliers following China (value terms), all increased the value of imports into Japan, except Bangladesh (-11.4%) and Spain (-7.1%). All other countries (Vietnam, Indonesia, Italy, Cambodia, Myanmar, Germany and India) have consolidated their position in the Japanese market and have registered two digits’ growth rates, with the exception of Myanmar (+1.3%). This set of numbers for the first half of the year seems to indicate that Japanese imports might be recovering from the decline in the previous couple of years. In fact, imports of footwear by Japan have decreased by 2.5% in 2014 and by 5.4% in 2015, after an 1.4% increase in 2013. According to the latest IMF (International Monetary Fund) estimates, GDP in Japan also seems to be recovering from the drop registered in 2014 (-0.031%), with a slight growth last year (0.473%) and estimates indicating this will continue in the current year (+0.486%). However, footwear imports into Japan are growing at a higher rate than what the GDP variation would suggest.